The Cast Lock is one of Hanayama's recent offerings and based on the 2014 IPP34 award winning competition entry design "Cassette" of Jin-Hoo Ann from Korea. 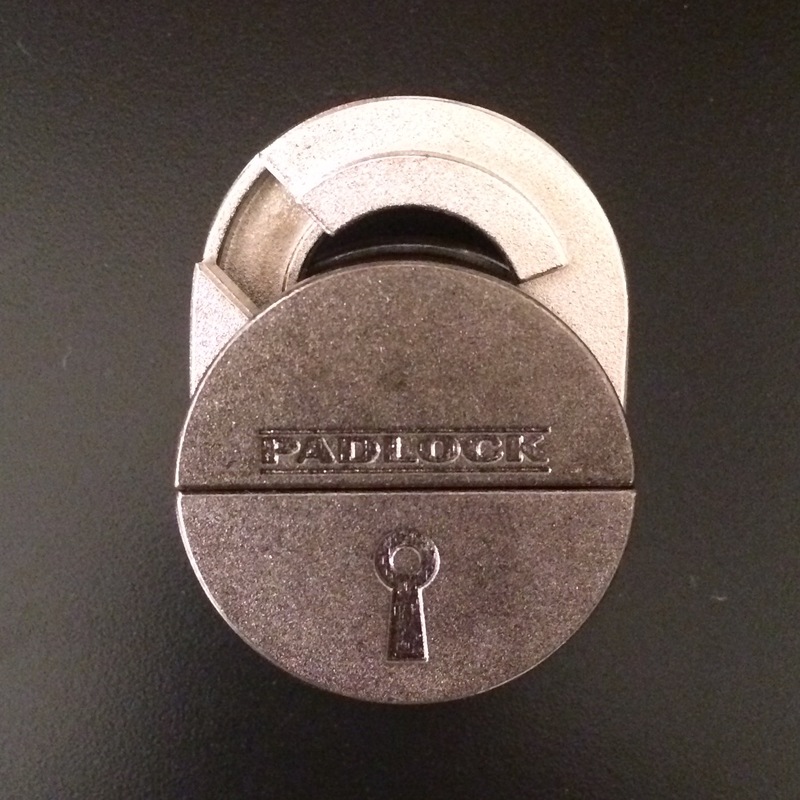 Shaped like a small padlock, the puzzle measures about 4.3cm x 3.1cm x 2.1cm. It consists of 4 aluminium pieces of which two "elongated" rings with notches form the shackle while the other two form the body of the lock. 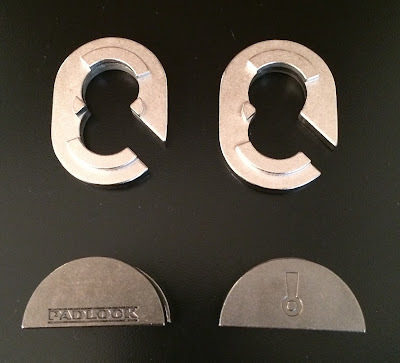 The objective here is to dismantle the lock into four pieces and put it back together again. Quality of construction, fit and finish is very good and there is certain "looseness" of the puzzle which I believe is intended for easy movement of the pieces. While the rings can swivel around the body of the lock pretty easily, the disassembly is anything but that. I don't have many Hanayama cast puzzles in my collection and for those that I own, I have managed to solve most of them without any help (well, I don't have many of the really difficult ones anyway!). But sadly, this lock eluded me despite several days of on-off playing. I managed to get past what I would consider the second stage and thereafter remained stuck. And stuck for a long time. Finally I threw in the towel and checked out the video solution which some kind soul had placed on YouTube. Looking at the movements which are serial and sequential in nature, I would not have been able to solve the Cast Lock on my own. The number of twist and turns and precise moves required to un-shackle the lock is pretty confusing and mind-boggling to say the least. This is a very difficult puzzle to take apart and Hanayama rates it 5 out of 6 stars (I think it should be a 6 out of 6). It has stumped quite a number of puzzlers since it came to the market but I know of one puzzler, blogger Kevin Sadler who has managed to solve it. Check out his review here. Jin-Hoo Ahn has really designed a gem. As I looked the individual pieces, they don't look that complicated but yet the sum of the four parts result in a very challenging puzzle requiring a lot of effort to solve. This is one of those prime examples of "less is more"? If you want a really difficult take-apart puzzle, the Cast Lock is one that will provide a lot of value for money. Outside of Japan, its presently available from PuzzleMaster of Canada. Unless I'm seriously missing something, the solution available on PuzzleMaster and even the first video that shows up on YouTube are needlessly complicated. I'd like to try one fresh out of the box, knowing what I do now, to see if my theory is valid.